My personal list is endless. And more places have been added to the long list after I read a post about the Department of Tourism’s program called Lakbay Jose Rizal @150 last month. The article tells about the tourist’s experiences and the places and sites that she went to under the DOT project. 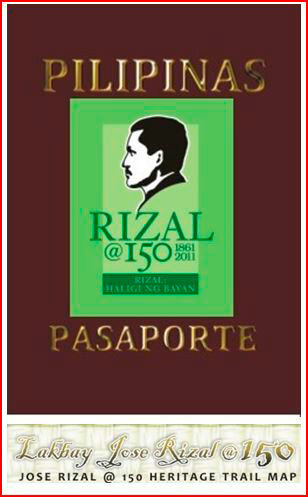 It was actually a contest (that ended last June) for the first 100 pilgrims who get to visit all the Rizal sites with the proof of the complete stamps in a passport-like booklet. Some of the places visited by Rizal include the areas in Bulacan, Camarines Norte, Cebu, Dumaguete, Iloilo, Laguna, Manila, Negros Oriental, Pampanga, Zamboanga del Norte. If I have a chance to visit any of those places, I would bring with me a sound system with excellentaudio interface logic for a superb listening experience while on a vacation. I hope DOT will conduct a part two of this contest for others who failed to join the initial project. This entry was posted in Tourists destination and tagged Lakbay Jose Rizal @150 on October 13, 2012 by Yami.